* In this version we correct the cpumining next payment amount and outstanding amount owed and resolve most of the bloated wallet issue. Please upgrade ASAP as this version will only work correctly after 51% upgrade. I just used the upgrade feature and was very impressed by how far you've come with it. I last tried it (instead of MSI) some weeks ago and got nowhere, but this time it went very smoothly. It took down my other running version of cgminer (3.10.0 running some ASICS) as a side-effect, but seemed perfect except for that. The elegant fonts make it fun to watch! Gridcoin is getting pretty slick these days. Gridcoin's dev is really active and promising now. I think we will have the final stable version with sleep-scrypt soon. I'm very happy to see the leaderboard factor dynamically changing for milky way; I see some huge credits accumulating on milky way and noticed our factor went from .5 to .29! So it is getting harder to exploit; so it's working as designed. Very cool. what's leaderboard factor for milky way? Got Accepted. Still no payments. Switching to solo mining again. Zulzedd, I don't know what is happening on your end. Can you try mining with Guiminer scrypt. I use that on several of my rigs and I have no problems. Also what is your gridcoin.conf look like? I transferred the last days some coins to my back-up wallet cos my wallet size is exploding (6Mb), all transactions succeeded, except the last one from yesterday. After that transaction I got three mined received transactions, they are all confirmed en show up in my balance. What can be wrong, are these coins lost?? 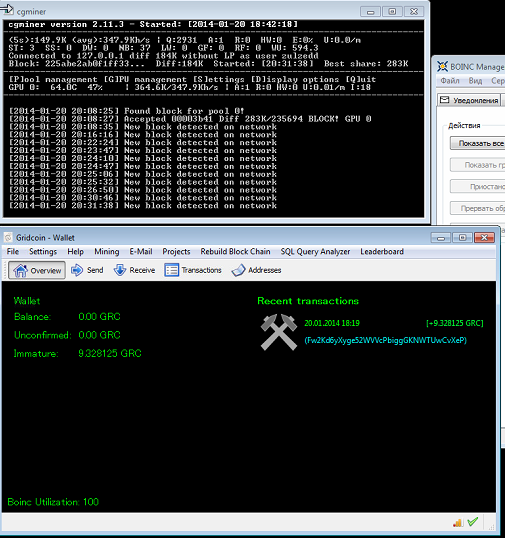 I used cgminer v 2.11.3 for 3 month on different rigs also and never had any problems. In my opinion — problem is definetly not in miner. It working just fine. I'm listed in miners list with my 3 accepted blocks, but i don't get any payments. if you have a wallet backup it's easy to get them back again. Just delete the current wallet with the lost coins, and put the intact backup in place. Then run gridcoin and it will rescan the wallet and adjust for all transactions that did and did not complete. I've been having a bunch of transactions not complete and get them back this way. Also, I had some that remained uncompleted for the better part of a day suddenly go through. I believe it had something to do with the timing of finding a new block. They sent right around then. So it might have taken them that long to notice they had a node to travel to and confirm on. I stopped mining this several days ago. Since about update 1.5 i stopped finding blocks. I could not get pool mining to work either. Before this update I had a Cudaminer that could find blocks and so I pointed my 280x rig to it. Both my rigs were running 100% boinc. When I was finding blocks they were proper payout. I attempted pool mining and got nothing as well. I will try again soon. Yeap. Problem similar to my. And developers are busy with CPU mining, hope this problem will be solved soon anyway. where i can download the new version which GRIDCOIN mentioned? DO i have to replace just the old one? before saving the wallet.dat, right? the blockchain sycronizing just 1 hour behind but it takes so long time..
must be because of all the problems people are having lately. This is because the main DNS server in China is down and they cannot connect to foreign countries. The chinese miners cannot syn. now. I am the leader of GRC chinese chatting group (now we have 150 members). A lot of people report this issue to me this morning. I suggest the dev. team should start/restart another giveaway thread. I am giving away in our chinese community group although I do not have a major share of GRC.